Artificial bamboo can play a great role in enhancing the décor of an office. Artificial bamboo is added to create a wonderful office environment that accommodates diverse working and emotional states such as calm, solitary and excited group exchanges. The first stage in the decoration is the abandonment of too much ornamentation. When you are creating an office divider using artificial bamboo, you cannot use excessive ornamentation. A simple color palette of grey, white and warm, natural wood will look perfect. The result will be great as it will look like a series of spaces, connected by materialism. It will provide the necessary environment of an office. You need a desk that has a series of curving loops for creating an office divider using artificial bamboo. The primary feature of this office décor is a central island in the middle of each desk that runs the length of the office. It divides the room elegantly and gives a beautiful look to the office. Functionally, it provides varied seating and desk space. The addition of stands of bamboo in the central island of the desk creates a natural and soft separation between the two halves of the room. Daylight lighting is perfectly balanced with interior warmer lighting in the working areas. The bamboo stands are skillfully incorporated into the office desk to create a natural division of space. The bamboo silk plants are low maintenance. 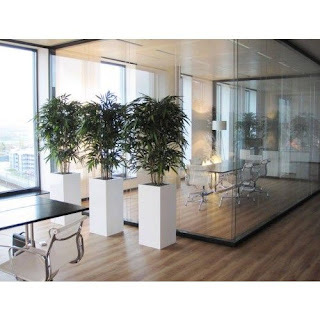 Therefore, interior designers can shape office spaces by using artificial bamboo. It is proven that design aesthetics influence the productivity of work space hugely. An office divider is often created using artificial bamboo to meet the needs of several workers in the office. Generally in an office, sound can echo and bounce off the walls creating a lot of distraction. Bamboo silk plants are known to absorb sound waves effectively, thus preventing distraction. Such an environment is required for offices that are involved in research. People can work better in an ambiance that heightens concentration. Bamboo silk trees look like pieces of artwork. They have enough texture and character to stand on their own. They create a stimulating and thoughtful office environment. Bamboo silk trees are widely used to separate and define space. Therefore, interior designers create a perfect office divider using artificial bamboo. There are many offices that have a mundane and dull look, which fail to energize its workers. Invest in artificial bamboo or other silk plants to enhance the office décor so that it can inspire the workers.